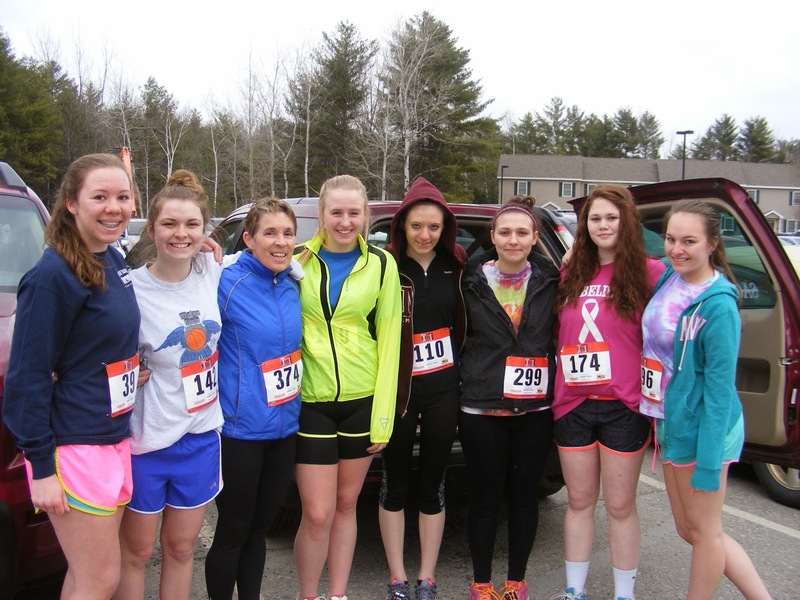 Sunday morning, I volunteered, for the 2nd year, to take photos at a local 5k at Thomas College in Waterville, Maine. From what I gather, this is the 3rd year for the race. The first year it was a senior project, then grew to about 200 people last year to over 500 racers/walkers this year. For a Central Maine town, it's a pretty decent sized 5k. The 1 in 5 piece to the race is this "1 in 5 people will experience sexual violence in their lifetime". For more information about the race, visit the website here. What I like about this race is that it starts a little later than a lot of 5ks, with a 9am start time. The race registration/expo is well organized, in the gym, which allows the participants a great place to stay warm until the race starts as well. Since it is April in Maine, you never know if it will be 80F or snowing! Race morning was a bit chilly and quite windy. Knowing it was cold there last year, I came prepared and brought my rain shell to fend off the wind and brought my gloves to stay warm. I found Harold prior to the start, chatted a bit about his training lately and checked out his new shoes and wished him luck. Then I found a group of HS girls who were there with their PE teacher, which I found to be quite inspiring. Shortly after 9, racers came out to the starting area and after a few announcements, the race started and off they went, up the hill. Yes - this guy ran in his jeans! I think it's absolutely awesome he does this. He did it last year too! He really makes me think I put far too much energy into picking out my race outfits! After the group of runners and walkers went past me, I headed inside to check things out and to warm up. Then I headed over to the finish line area. There I was standing next to a wonderful lady who was cheering on every single running coming in. She was full of exciting and I loved it! We chatted a bit and I found out that she will be in Boston on Monday as well, as her husband qualified for Boston too! This was going to be his first year and they were both so excited to be going down. I shared some of the things I've learned over the past couple of years. 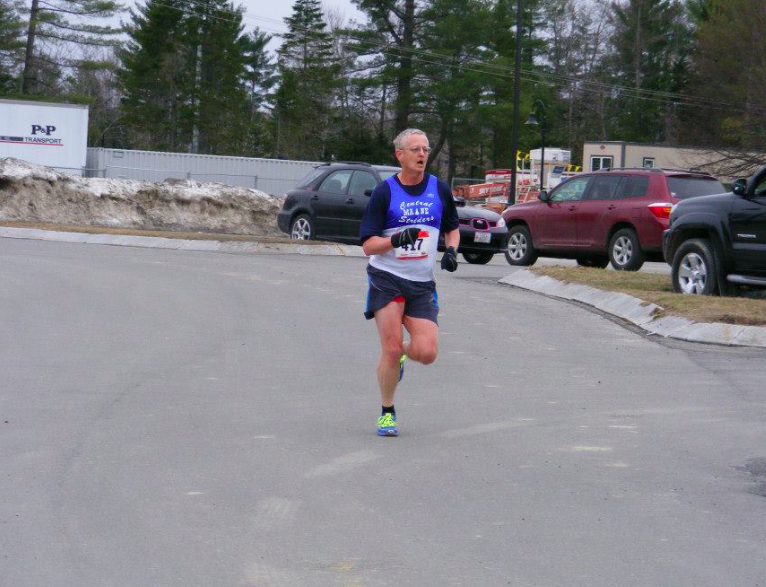 You can see my race photo collection on the Maine Running Photos blog or on the Facebook page. I am happy that I've been able to take race photos over the past couple of years. I know that after I run a race, I love going back and checking out my race photos and Maine Running Photos does this all for free. 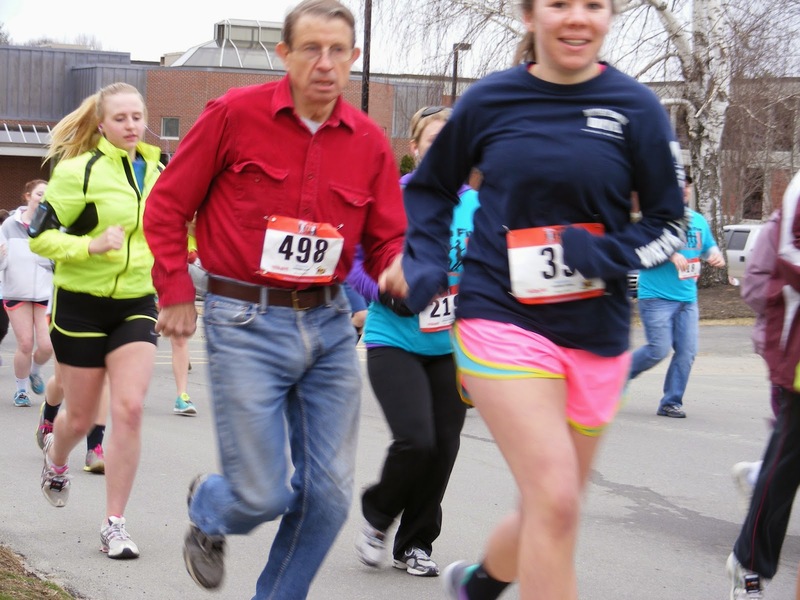 The man behind Maine Running Photos - David Colby - spends endless hours finding races in Maine and trying to get coverage from the many volunteer photographers throughout the state. It's a pretty amazing thing to be part of. I look forward to taking more photos at more races this season and many more seasons to come. Do you volunteer for races? Ever take race photos before? How do you give back to the racing community? I am thinking sometimes it would be nice to worry so little about what to wear for a race, but I still couldnt bring myself to run in my jeans! Awesome job volunteering! I love reading about your photography opportunities and volunteer work. You are a runner that truly gives back to the whole community:) Loved seeing you mention Harold in your blog too!